Tucked up in the northwestern corner of North Carolina is the small town of Crumpler. 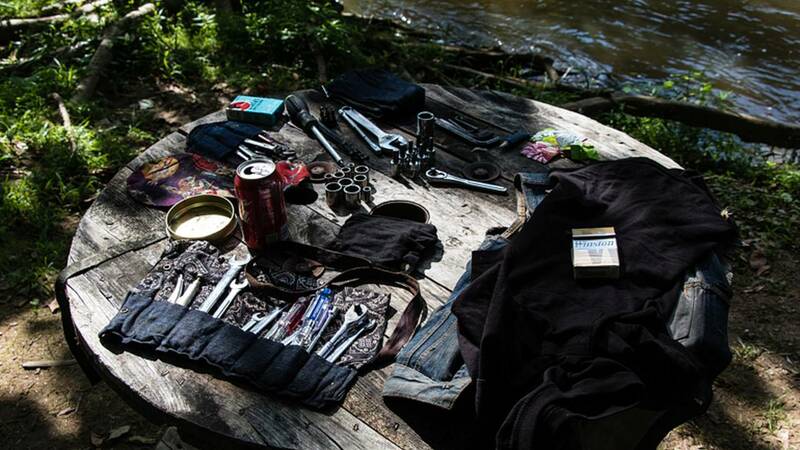 Last August, this sleepy little mountain town, with a population just under 3,000, was overrun with hundreds of choppers as folks rolled in from all across the country to the Twin Rivers Family Campground for a three-day camp out held on the banks of the New River. 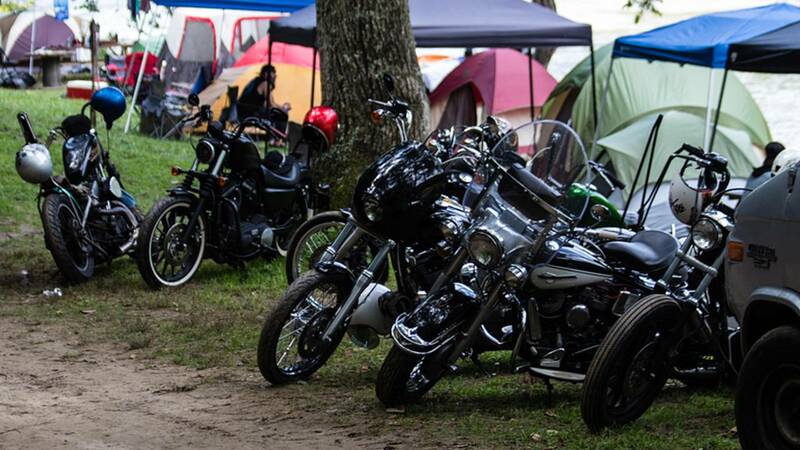 Organized by Zac Gibbons, the campout was a traditional chopper event, which meant it was a laid-back weekend filled with great people, good times and no BS. 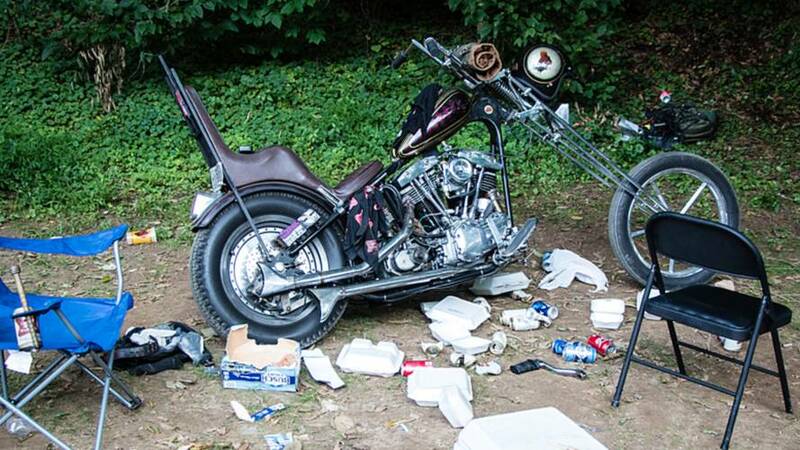 There is just something about the simplicity of a well-built chopper. Now, technically, I don't have a chopper. And by "technically" I mean, "in reality." 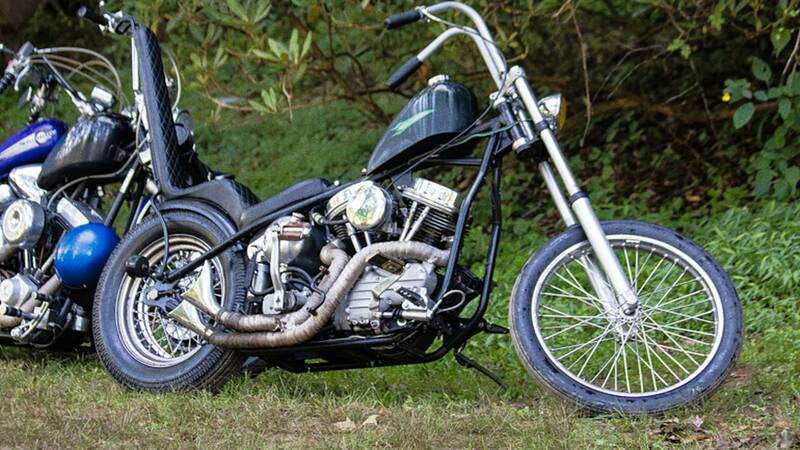 I do have a '64 panhead, though, and even though it is bone stock, it still garners some appreciation from the chopper crowd since it is a crusty old Harley. It also has hard bags and a big luggage rack. So, while it's not lean and mean, it can hold all my camping gear and still have room for my ever-increasing stockpile of tools and spare parts. It's also great on the highway, making the 150-mile ride up to Crumpler a piece of cake until I reached the mountains. Then things got a little more challenging as I tried to hustle that overloaded beast around the curves with nothing but a barely adequate rear brake to stop me (it has a front brake, but that's mostly just for looks). Thinking ahead, Zac had already reserved the entire primitive section of the campground, which was located about a mile past the clubhouse right alongside the river. The only problem was that "primitive" also was a good description of the road leading there. Once you passed the RV section it quickly degraded into a one-lane track over loose rocks, with the river on one side and a rock face on the other. 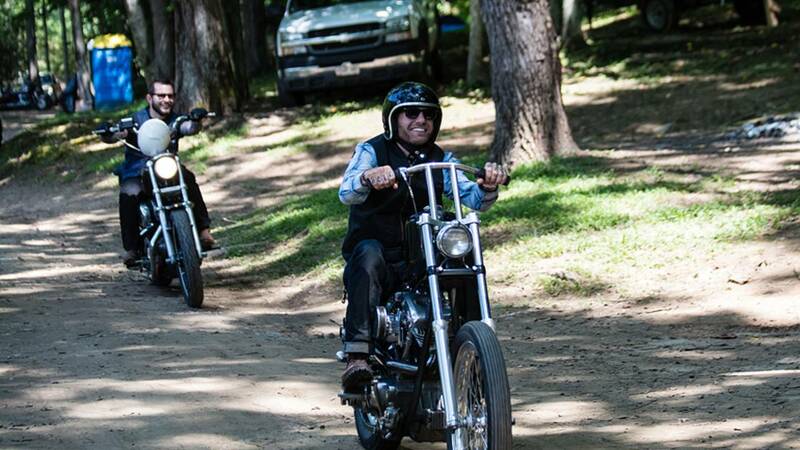 If anything, it did do a good job of keeping everyone riding through the campground at a reasonable speed – and thinking twice about the merits of hardtail frames. No front brakes, skinny tires and a hand-shifted transmission can make for a challenging ride, especially off road. Having gotten an early start, I arrived at Twin Rivers just after lunch and there were plenty of camping spots left to choose from along the river. I took a few minutes to set up my Atacama Expedition Tent from Redverz Gear right in the center of the campground, so I would be close to all the action. 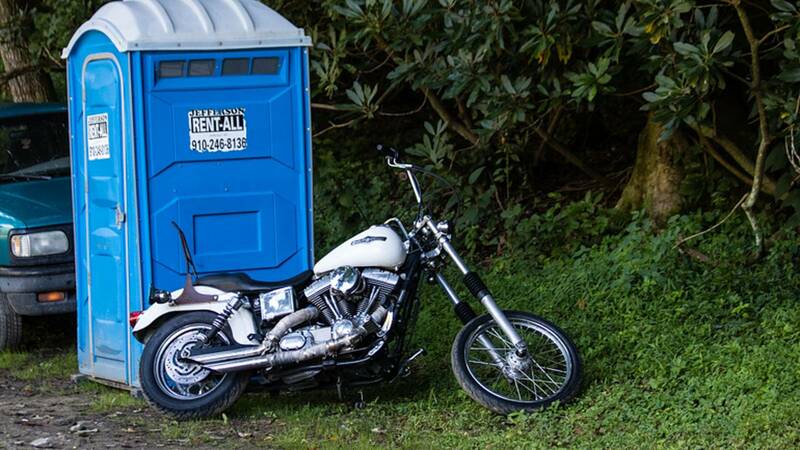 A side note on the tent, if you are into motorcycle camping it is a must-have as it has both room for you and your motorcycle, with an added vestibule that is designed to be used as a garage. While picturesque, with the river literally just a few feet from my tent and a slick grass embankment being the only access route, I decided it would be best not to risk rolling my panhead inside. Being riverside was great, even if I had to forgo using my "garage" for storing my motorcycle overnight. By Friday afternoon, more than 200 folks had made their way into the campground and the party was just getting started. Daniel Biggins had been brought in to handle DJ duties and the landscape of the campground provided the perfect backdrop for his equipment. Basically he was able to set up against the base of a small cliff which reflected the sound directly into the center of the campground. 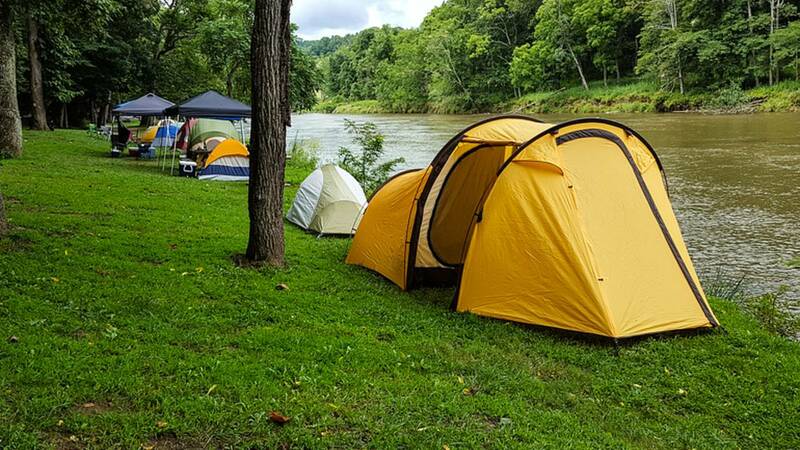 Normally this would cause all sorts of complaints from the families and retired folks in the RVs, but since the property was located on a horseshoe bend in the river, the music was projected away from the main office and RV section of the campground. This meant there was not a single complaint, even with the music roaring into the early hours of the morning. 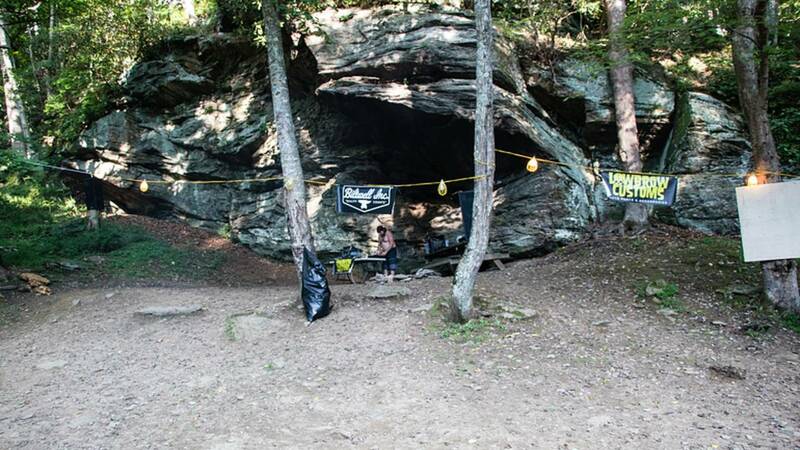 The "Rave Cave" as it came to be called was a natural DJ booth located right in the center of the campground. Saturday morning I awoke to what sounded like rain hitting the top of my tent. Muttering under my breath about how much I hate camping in the rain, I got dressed and stepped outside to a clear sunny day. Looking at the top of my tent I could see it was covered with little brown balls. As my eyes tracked upwards, I spotted a large nest of tent caterpillars who were busily devouring leaves and raining crap down on my tent! Looking down the river I saw that most of the trees were filled with the same nests and quite a few other bikes and tents were covered in brown speckles. 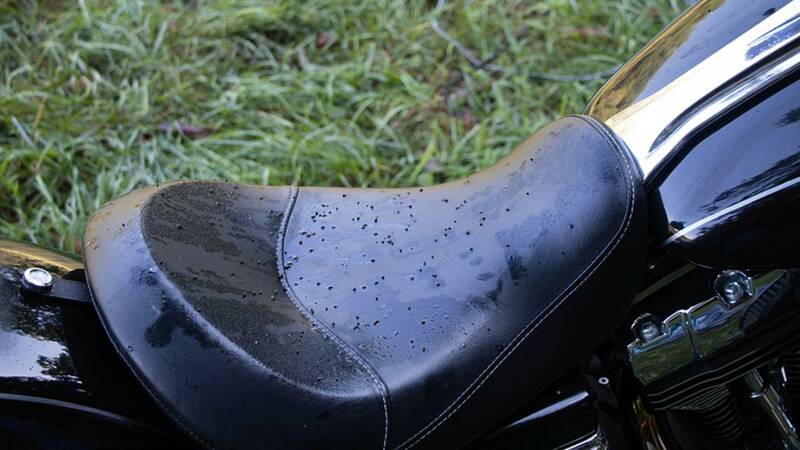 I wasn't the only victim of the caterpillars, seems they liked raining crap on motorcycles and tents alike. As people began to stagger out of their tents, everyone was relieved to see that a food truck was parked nearby, cranking out breakfast. I don't know how he made it down that road to the camp, but I was sure glad to buy some banana pancakes to start my day off right. 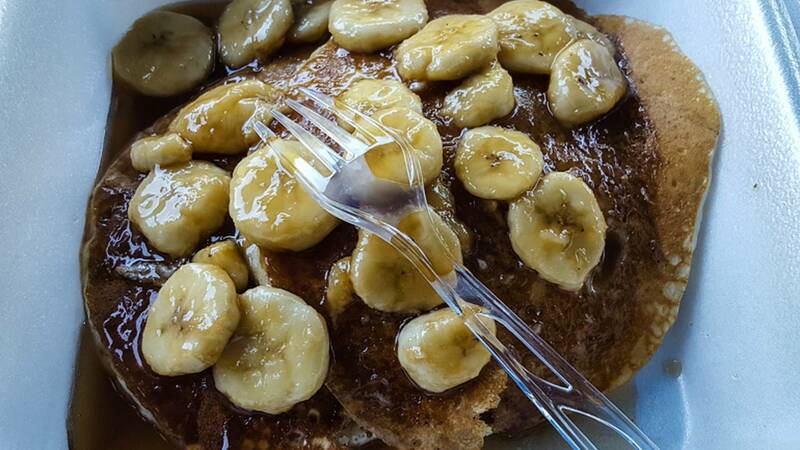 Pancakes, syrup and caramelized bananas, the breakfast of champions. This was a fairly low-key event as far as scheduling every minute of your time, so everyone was pretty much on their own for the entire day. Plenty of groups headed out to ride the mountains, but it seemed that almost as many people just stayed around the campsite. The river was just deep enough for tubing, but the current was such that you could wade out to the center without getting swept away. There were a few large rock outcroppings in the center of the river and soon "Dude Island" was founded as a place for men to hang out and drink beer. RJ hitching a ride upriver for some tubing. 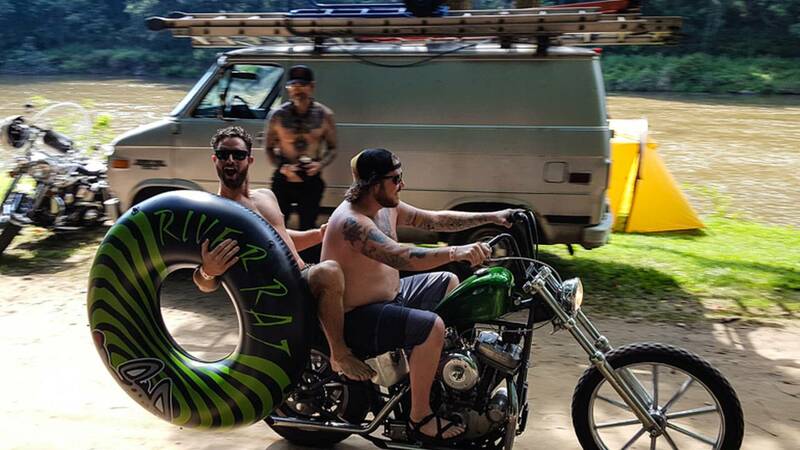 While everyone was baiting leeches out in the river, I helped hand out "Cool Bike" awards around the campground. Basically this was just a way for Zac and the other folks who put on the event to recognize some of the cool motorcycles that had ridden to the camp out without forcing everyone into a typical bike show. Personally I am a bit a vintage bike snob, so I only wanted to hand out awards to panheads and knuckleheads, but there were plenty of more modern machines that took home a custom wooden plaque tied to their sissy bars. 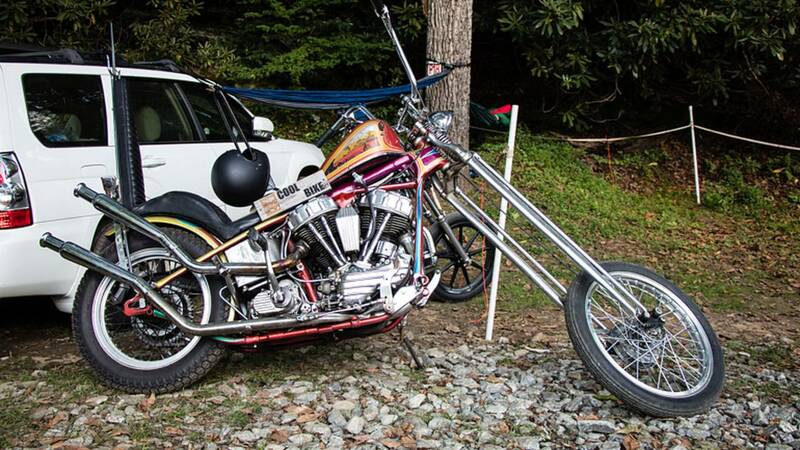 A survivor chopper from the 70s. Great to see bikes like this still on the road. 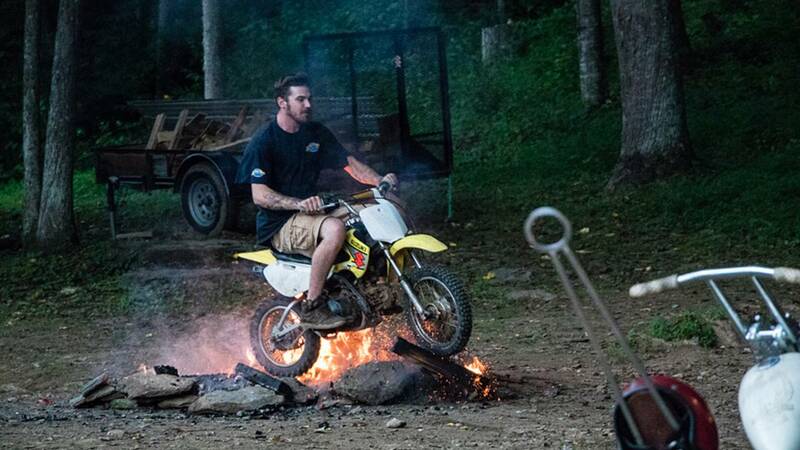 This guy woke up on Sunday with a few unexplained burns and bruises, but the motorcycle made it through the weekend unscathed. One of the highlights of the event was the Saturday night raffle. There were more than two dozen companies that sponsored the event and they donated everything from T-shirts to custom chopper parts. 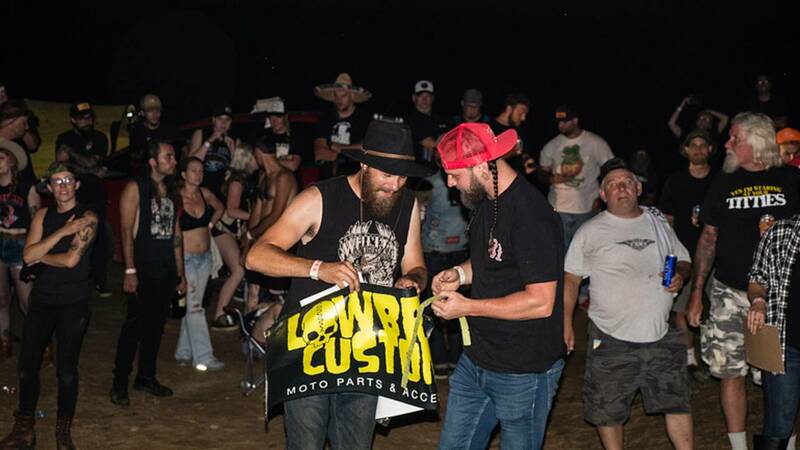 I personally won half a dozen T-shirts, a brass belt buckle, and some handlebar grips. Once the raffle finished, the music cranked back up and the party moved into high gear. The DJ was taking requests, which made for an eclectic playlist where at one minute you were banging your head to Iron Maiden and the next you were jumping around to House of Pain. It was another late night at the campground with the last of the diehards finally heading back to their tents sometime after 4 a.m.
Zac double checking Demar's ticket, there were a load of great prizes given away at the raffle. All good things must come to an end and by noon on Sunday everyone had packed up and headed for home. As I said my goodbyes throughout the morning the one thing everyone agreed on was they couldn’t wait to come back next year. Although it is still almost a year off, I know that Zac is already planning for an even bigger and better event in 2018. To stay up to date, check out @twinriverschoppercampout on Instagram or find him on Facebook. 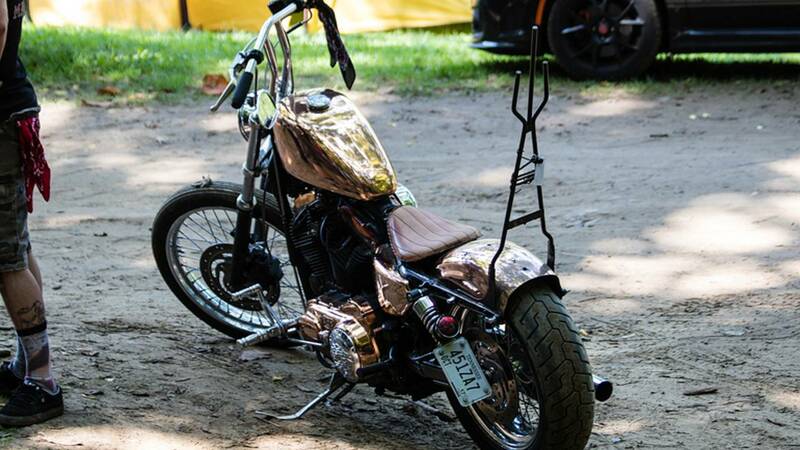 That's not paint, that is a completely copper-clad motorcycle. Just keep it out of the rain. Impromptu repairs were performed throughout the weekend. The best thing was, none of them were on my motorcycle. 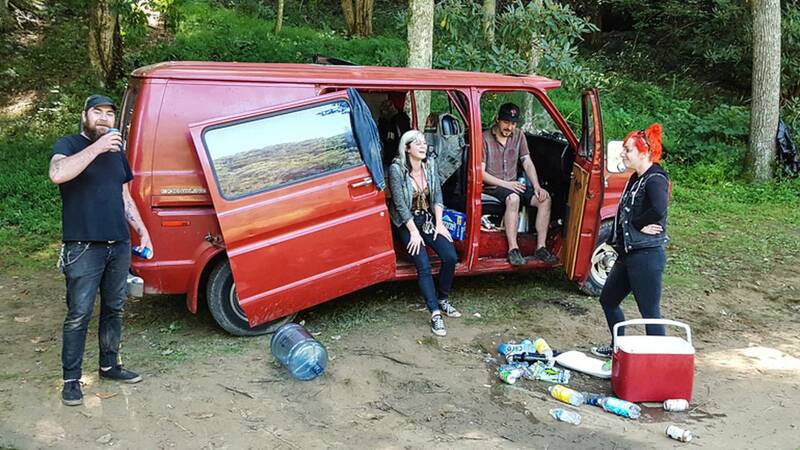 This van rolled in from PA with six people and a dog. I hope it made it back!